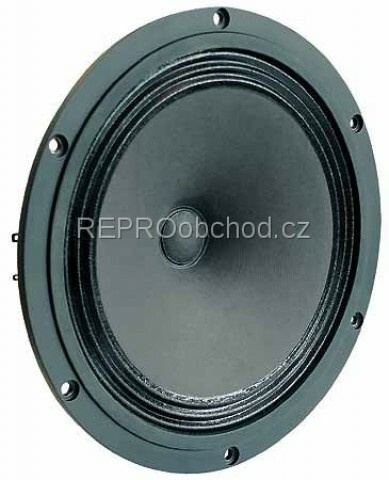 20 cm (8") High-end full-range loudspeaker. These high-end speakers stand out because of their high degree of sensitivity and extremely well-balanced frequency response free of noticeable deviations. This is achieved by using a very light-weight paper cone, a fabric surround and an optimised driver equipped with a 25 mm voice coil (aluminium wire) which makes optimum use of the magnetic field in the air gap. The capton voice coil carrier is vented. The sturdy aluminium diecast basket is not only optically appealing but, thanks to its rear-venting openings, ensures that physical losses are minimised. Distortion is suppressed to a very low, uniform level. The B 200 is ideally suited to use in high-quality, powerful single-band speakers, where the cabinet design need not be restricted to classic, fully enclosed or vented cabinets, but more exotic alternatives like horns or open baffles can be used to create amazing results.